„Let’s be honest. We know, that we wont able to save the world with this website. But maybe we can change the world, just a little bit. Or someone’s world. We are trying to accomplish this for one, by pointing out a few facts that could be the reason for why there are less female than male skateboarders. And for the other by focusing on how it could be. How it would be, if there were no discrimination based on gender. Sexism starts basically when a girl is first judged for being a girl and only after that for being a person. Therefore sentences such as: „For a girl she’s damn good at skateboarding“ is openly sexist, even if it’s meant as compliment. Very clearly and most importantly: (Hetero-)Sexism is a socio-cultural problem. It’s not only the skateboarding scene that has to deal with such discrimination. But it is a field that definitely has its problems with it. Because of some people that still act as if the middle ages had never passed and the Women’s Right Movement had never happened. Sad but true. 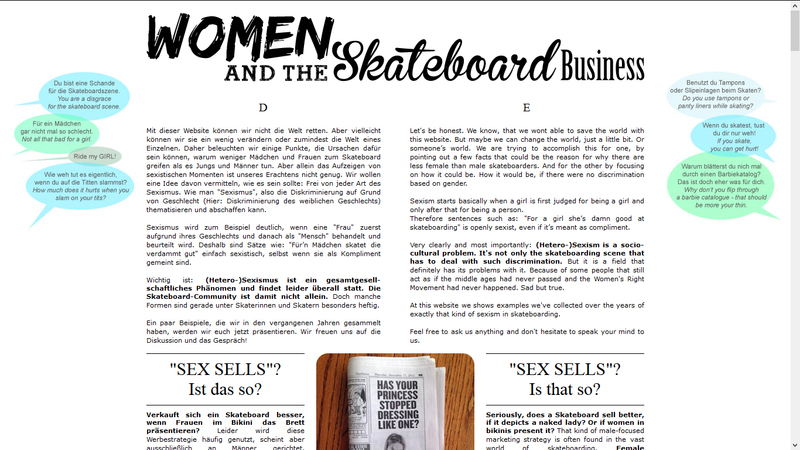 At this website we shows examples we’ve collected over the years of exactly that kind of sexism in skateboarding.